Wednesday, the 15th of February was definitely the biggest day for IPPNW at the ongoing 4th Arms Trade Treaty PrepCom. We had a double header of hosting a side event and addressing the states delegates during the NGO presentations right after that. The side event focused on the role of public health and civil society in monitoring the Arms Trade Treaty (ATT). This topic was especially pertinent, as some states have sought to limit the participation of NGOs in the negotiations for a robust Arms treaty. Star of the day was Dr. Omolade Oladejo. I will get to that later. Donald Mellman, MD, of IPPNW, a trained mediator himself, proposed a role for NGOs as mediators in potential disputes between civil society and states. These disputes, he said, could arise from denials of arms transfer, or a third party questioning a particular transfer etc. As neutral non-state parties, trained NGO independent mediators are well positioned to settle disputes when such arise. Dr. Mirjana Dokmanovic, Director of IANSA, spoke on monitoring the ATT in an International Humanitarian Law (IHL) context. IHL, she said, provides rules to protect persons who are not or are no longer taking part in hostilities and limits the means and methods of warfare. She stressed the obligations of states in respecting the IHL, and in acting within its criteria on the ATT. The provision here is that after a careful assessment, states must not authorize an arms transfer if there is a ‘clear risk’ that such weapons would be used to commit serious violations of IHL. The ever jovial Dr. Robert Mtonga stressed the need for the ATT to be seen in a humanitarian perspective, as it is aimed to control the trade of the only commodity that is designed solely to kill or injure people: arms. 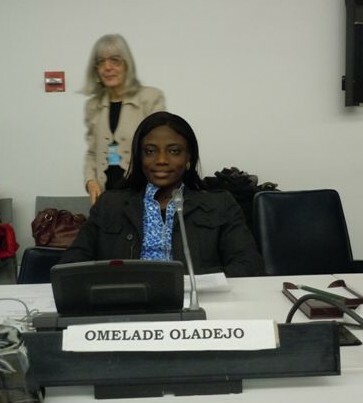 Now back to my friend, Dr. Omolade Oladejo. She spoke at the side event on “The contribution of the medical community in controlling the illicit use of firearms”. An hour later, she addressed the states plenary assembly on the “Humanitarian Imperative of the ATT”. She outlined many examples of how physicians could assist in monitoring an arms treaty, including research and documentation of firearm injuries and outcomes, using public health tools to evaluate policies, etc. If her first speech did an excellent job in identifying possible roles of physicians in monitoring an arms treaty, the second speech did an even better job in speaking up for victims of armed violence. It was very compelling and emotional. “I was one of the first responders to the bombing of the United Nations Headquarters in Abuja, Nigeria. When I arrived, I saw bodies and body parts everywhere”, she said. I was close to tears, and I could see the same on the faces of many delegates. At that moment, everyone in the room was united. Alliance or nationality no longer mattered. We were united by anger, fear, and hope. Anger and fear at the cruel termination of lives, and a hope that we would act to prevent similar killings by adopting a robust arms treaty. ← An 80% reduction? Now that’s a down payment on a nuclear-weapon-free world!